The Olympics are long over but I'm still recovering from the lack of sleep that continuously accumulated over the two week long event. So, to celebrate the closing ceremonies last weekend (and the joy of finally being able to go back to my regular sleeping schedule), I put together a festive American light and summery dessert with an Italian twist, of course! Absolutely, I was rooting for the home team, but I still had some cheer leftover for my ancestors' hometown, Italy. So, to jazz up this bowl of fresh berries, I added a small handful of mint and a splash of Amaretto liquor to not only the fruit but also the cool whip topping. The mint and Amaretto add a refreshing and nutty surprise to each sweet bite. And if you want to get wild and crazy, add a few slivers of toasted almonds and a light sprinkle of cinnamon on top! 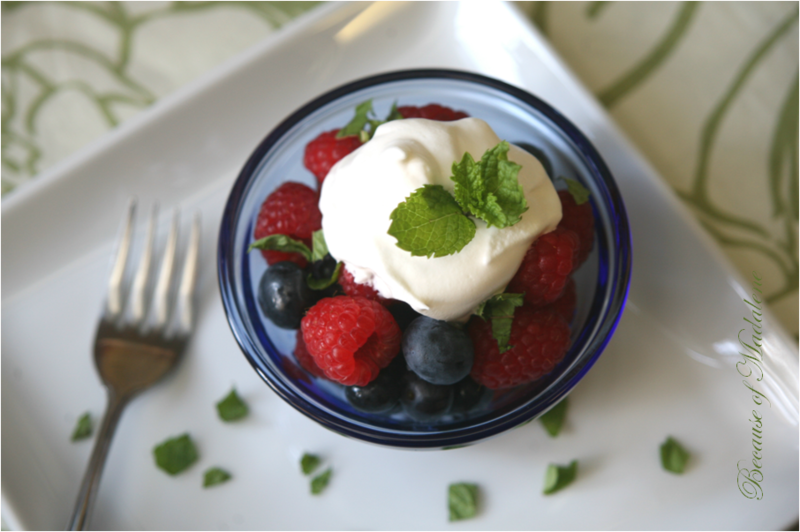 In a small bowl, lightly toss the berries and chopped mint with 1 tbsp of Amaretto. Set aside. In a separate bowl, fold in the remaining 2 tbsp of Amaretto into the cool whip. Divide the berry mixture into 4 small bowls and top with a dollop of cool whip. Garnish with whole mint leaves.